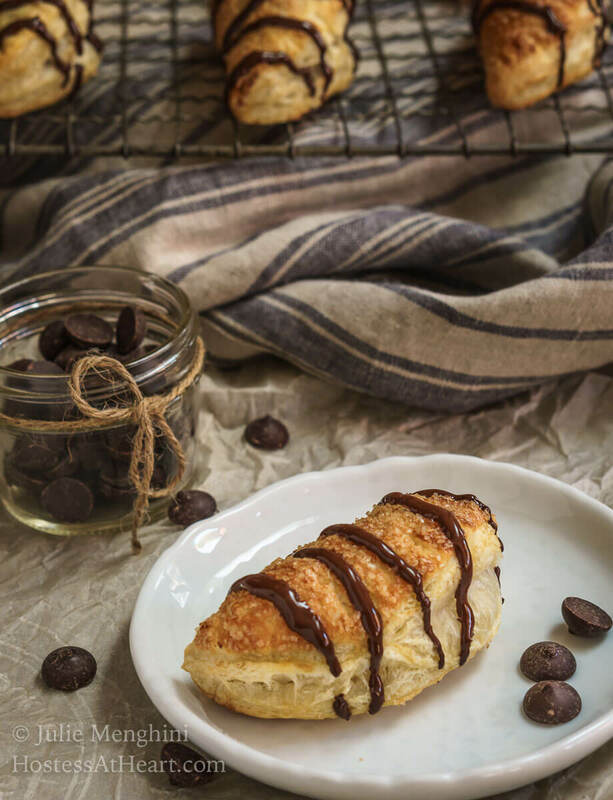 Dark Chocolate Puff Pastry Hand Pies have a light, airy and soft interior enhanced by a deep dark chocolate. 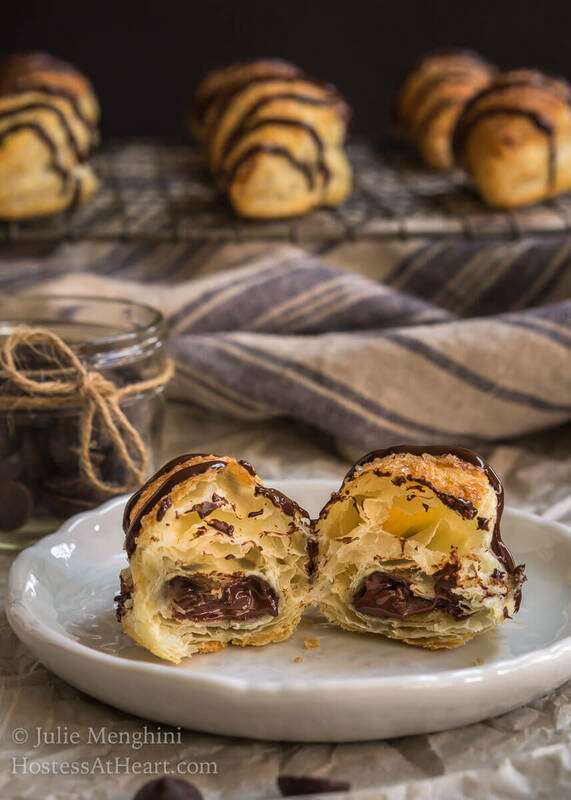 The whole thing is wrapped in a golden brown Puff Pastry with a delicate crunch. It isn’t often that I get requests…from 6-year-olds! So when my little neighbor friend told me that my Pear Hand Pies were great but would have been better if I’d filled them with chocolate I took his comments to heart. 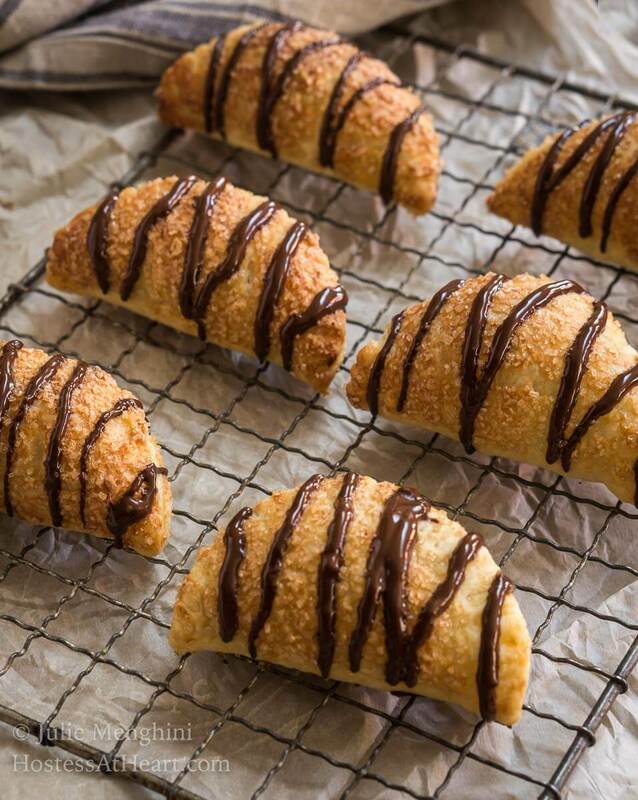 My wheels started turning and Dark Chocolate Puff Pastry Hand Pies became a reality. When I made those Pear Hand Pies, I went to the trouble to make my own crust. With the holidays coming up, I wanted to come up with something that would be perfect for my holiday brunch. It has to be quick and make my guests feel like I’m glad that they’re here. Puff Pastry was my answer. 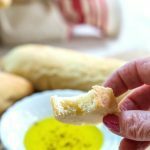 I’ve used Pepperidge Farm® Puff Pastry Sheets for so many dishes in the past including Apple Pecan Pastries that were so easy to just roll up into little danishes and a light Herbes de Provence Pot Pie. I knew Puff Pastry would be perfect for this project too. 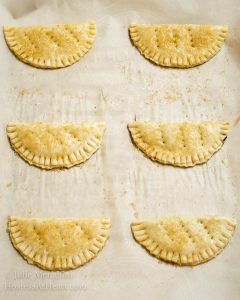 Puff Pastry Sheets are so easy to use. I dusted my counter with a little flour and rolled them out gently from the center just to smooth them out. If you have a tear you can easily repair it with a finger dipped in a little water. 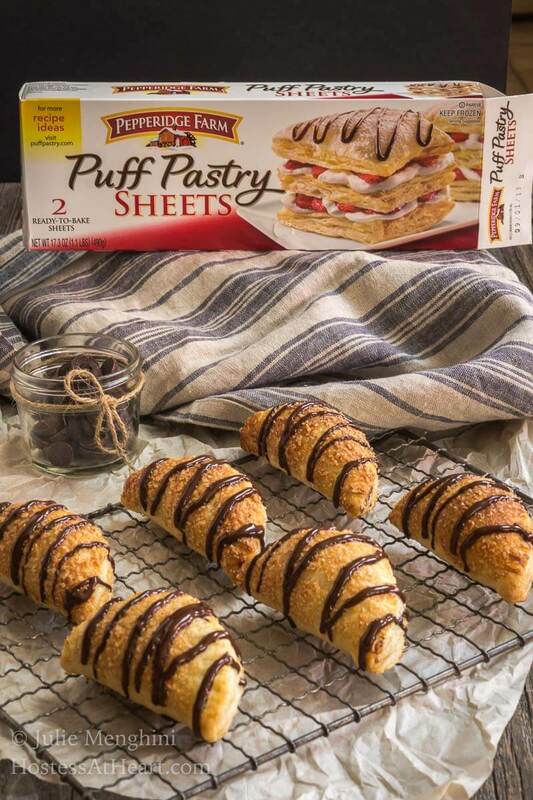 Pepperidge Farm® Puff Pastry Sheets are available in the freezer section of your local grocery store. I bought two boxes just in case I needed to do a remake. The good news is these hand pies came out looking like I’d been making them for years. 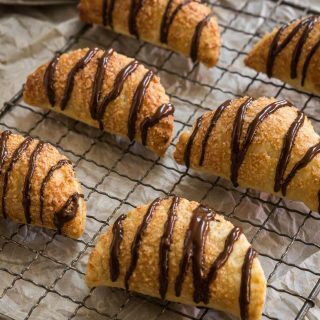 I brushed these Puff Pastry Hand Pies with an egg wash and then sprinkled them with turbinado sugar leaving them golden with a subtle sweet crunch. The interior was light, soft and airy and enhanced with a deep dark chocolate. These Puff Pastry Hand Pies looked and tasted exactly like what I want on my brunch table. Pepperidge Farm® has several recipes available on their website here if you need more great ideas. Preheat oven to 400°F. Line two rimmed baking sheets with parchment paper. Set aside. 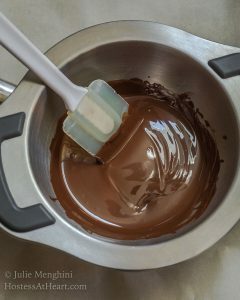 Melt chocolate chips in a double boiler. When they are about half melted, remove from heat and stir until melted and smooth. Lightly flour a working surface. 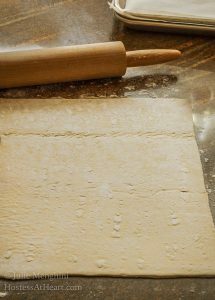 Unfold a Puff Pastry Sheet and roll from the center with a lightly floured rolling pin. Stamp 6-4" circles with a cookie or biscuit cutter and place them on the prepared baking sheet. Whip egg white and water together. Brush the edges of each circle with egg white using a pastry brush. 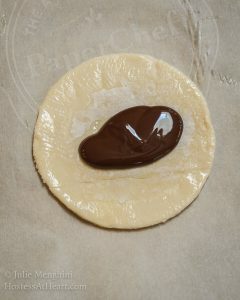 Spoon a Tablespoon of chocolate into the center of the Puff Pastry circle. Fold in half meeting the edges together. Crimp edges with a fork. Brush top with additional egg whites. Sprinkle with sugar. 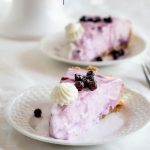 Pierce the top about three times gently with a fork or sharp knife. Bake for 12-15 minutes or until top is golden brown. Remove to a cooling rack. Put remaining chocolate in a re-closable plastic bag. Snip a small corner from the bag and drizzle the tops with additional dark chocolate. Serve immediately or store in an air-tight closable container at room temperature. I spooned chocolate into a re-closable plastic bag as soon as I was finished with it. If chocolate starts to set run it under hot water massaging the bag until smooth. Alternately you could reheat in the double boiler and let cool slightly and drizzle with a fork. I would like to thank Pepperidge Farm® for sponsoring this post and allowing me to tell people about a product that I use and love. It’s a quality product that works every time. Oh, by the way, my little neighbor did a taste test and these Dark Chocolate Puff Pastry Hand Pies passed with flying colors! Whew! I can’t wait for a couple more ideas from this kid! Make sure your pastry edges are all sealed, Lea and don’t overfill. Also, remove the chocolate from the heat when it’s only half melted and stir until smooth. Please let me know if you continue having problems so we can figure this out for you. Thank you for reaching out. Haha! What a cute comment! Thank you, Jhuls! Those sheets sure come in handy. I’ve never made puff pastry by hand. I’m too lazy! 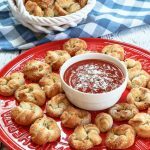 They are so easy and yummy Lily! Thanks for stopping by! Thank you Antonia! I love chocolate and chocolate filled croissants! I had the most amazing ones in Italy. Ahhhh such memories. These are much easier to make! Thank you for co-hosting this week too! Ooooh! I love your recipe. My daughter is a big fan of chocolate. 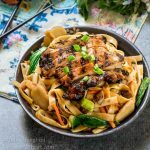 Can’t wait to try it:) Thanks for sharing this fantastic recipe! Thank you! They are quick and easy too. I absolulely love this! Such a great idea and my husband is going to freak out for these 🙂 Thanks for getting me brownie points haha! Hahaha I hope it works Sarah. They’re so easy to put together and then you can just throw a little flour around so he knows how much trouble you went to. Oh my word – these are gorgeous! I can’t wait to make them. I love, love using Puff Pastry Sheets! Thank you so much Patty! They are a great convenience ingredient. Uh … yeah! You need to consult that six-year-old more often! These look sort of like quick-and-easy chocolate croissants. What a great idea! I know right! I don’t know if I can afford him. Laffy taffy usually does the trick though. 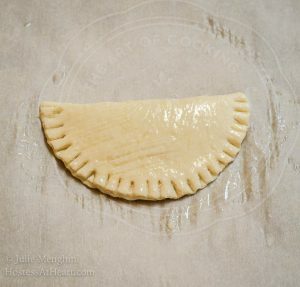 Julie, your puff pastry hand pies look a-ma-zing and are so easy to make. As I’m a dark chocolate lover, I will definitely try your recipe soon. They are super easy Ana! Thank you and I hope you get to try them. Your little neighbor has great taste! Hahaha Johanne. He was so funny with his critique. I think John agreed with him too and chocolate is always a favorite with me. Thank you so much, Tamara! I love Pepperidge Farms Puff Pastry too. It’s just so darned convenient and makes everything look a bit fancy. Cute Julie – a six year old inspired you 🙂 I use both the sheets and the shells for sweet and savory recipes. I know Judi! He was so darned sweet with his critique. He didn’t want to hurt my feelings. I’ll have to consult my next ideas with him. Oh my Julie, these look amazing! Pepperidge Farm pastry sheets are my best friend too :). I’ve already bought a couple of packages for the freezer. Most of the time I make them with a savory filling, perhaps I should now try that sweet chocolate oozing from the center. I try to use every little bit of the remaining pastry and roll it out again and again, however it gets harder and harder to handle when you re-roll. The first batch is always lovely and crispy. Great photos, love the dramatic effects. Thank you, Loretta! I used the scraps too. I just sprinkled them with cinnamon and sugar just like my grandmother always did with her pie dough scraps. We loved those more than the pie I think.